http://www.dailytimes.com.pk/entertainment/03-Feb-2015/cancer-deaths-worldwide-to-rise-to-over-11mn-in-2030 For decades health officials told that cancer is declining, but suddenly they report that it is rising. Everybody who came near one of the overcrowded ontological wards in the hospitals knew that. http://www.outsideonline.com/outdoor-adventure/nature/Jairo-Mora-Sandoval-Murder-Trial-Ends-in-Acquittals.html Justice not done! The poaching can continue with impunity. http://ehp.niehs.nih.gov/123-A34/ Thoroughly researched and informative. http://deepgreenresistancecolorado.org/2015/01/26/nations-biggest-mall-colorado-will-destroy-one-largest-prairie-dog-colonies-colorados-front-range/ Prairie dogs are cute,but who cares. http://www.climatenewsnetwork.net/no-prospect-relief-constant-nuclear-headache/ Our descendants will hate us. http://www.japantoday.com/smartphone/view/technology/robot-to-probe-melted-fukushima-reactor TEPCO has run out of homeless people? http://www.environmentalhealthnews.org/ehs/news/2015/jan/bpa-exposure-linked-to-changes-in-stem-cells-lower-sperm-production Human overpopulation problem solved. http://www.globalresearch.ca/whats-behind-big-pharmas-freak-out-media-blitz-over-measles/5430542 Hard to say what is right, but in this time of universal deception alternative views have to be considered. http://friendsofkosovo.com/2015/01/31/steamrolled-a-special-investigation-into-the-diplomacy-of-doing-business-abroad/ This would as well fit into the category “imperial conquest news.” It is a prime example how to fleece a “liberated” country. http://www.tomdispatch.com/post/175951/tomgram%3A_engelhardt%2C_i.f._stone_and_the_urge_to_serve/ An icon of old-school US journalism, a gifted writer, always trying to be honest, but nevertheless not able to jump the US-shadow, finally writes something really essential. http://www.zerohedge.com/news/2015-02-03/another-conspiracy-theory-becomes-fact-entire-oil-collapse-all-about-crushing-russia If it would be that simple…. https://www.middleeastmonitor.com/news/middle-east/16463-israeli-soldier-gives-74-year-old-palestinian-woman-water-then-shoots-her-in-the-head a more narrow definition of the human race: Gentiles don’t belong to it. https://www.middleeastmonitor.com/articles/middle-east/16902-water-running-dry-for-palestinians-as-israel-turns-off-the-taps Drying to death the vermin. http://www.balkaninsight.com/en/article/serbia-quietly-grants-citizenship-to-abbas-rival Every country has its price. http://www.counterpunch.org/2015/02/02/venezuela-a-coup-in-real-time/ The empire never retreats. It has been colder in the last weeks and the trees, fields, meadows, and roads were (and still are) covered with a thick blanket of snow. The cats are most times in the house, gathering around the wood stove, which is providing cosy warmth in parallel to the central heating. 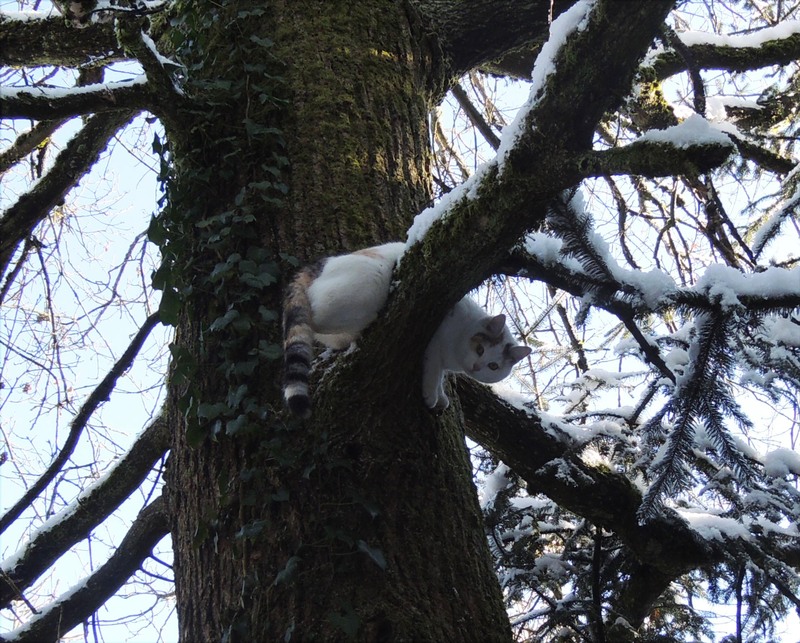 The uncomfortable climate converts my feline friends temporarily to indoor cats and it also makes them weary of going outside into the wood to the places which they usually use as toilets. 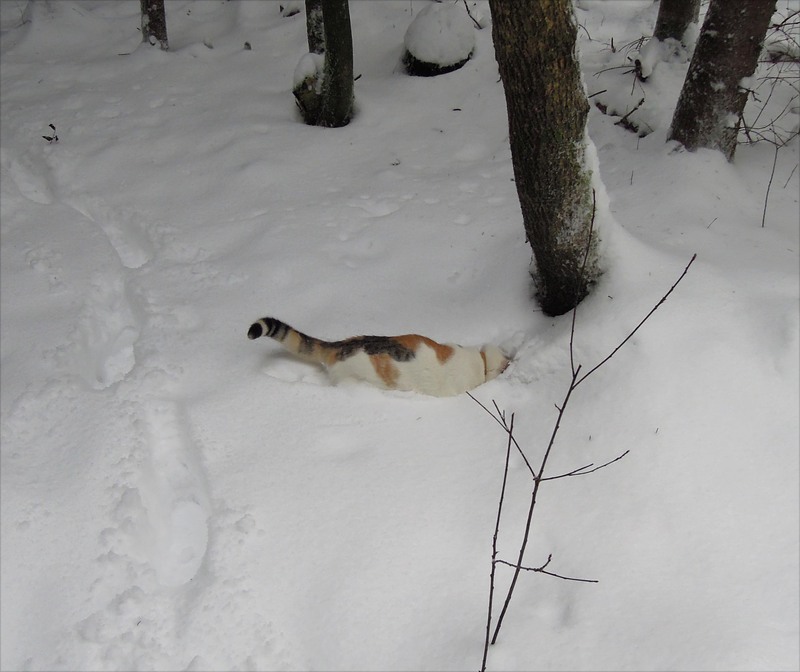 Most cats are clean and tidy and take care to cover their poop, but going out into the cold and wading through the deep snow is too much ask for the senior cats, and therefore for them I have set up three litter boxes. 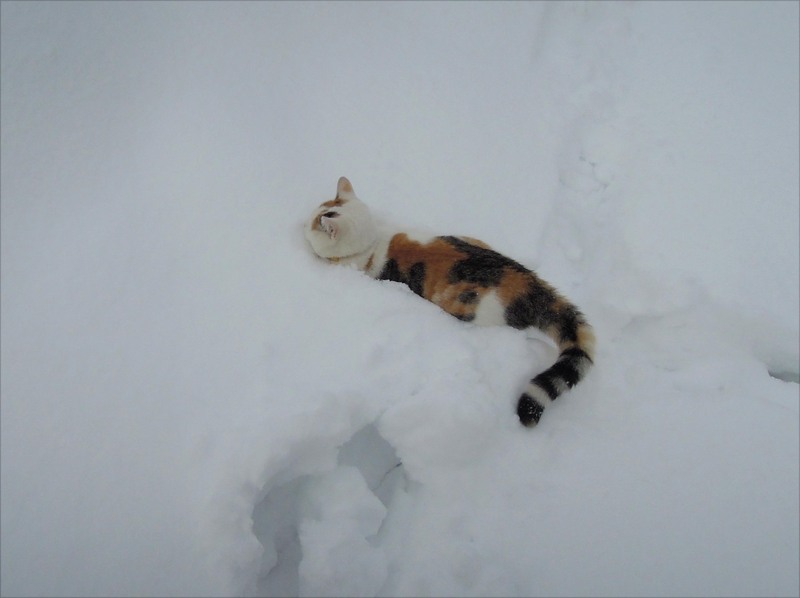 Unfortunately it took not very long for the younger cats to find out that the litter boxes are indeed more convenient than going out into the snow and they too now increasingly use them for their business. So I’m busy cleaning up the litter boxes at least once a day. It is a labor of love — and I’m hoping for warmer weather! 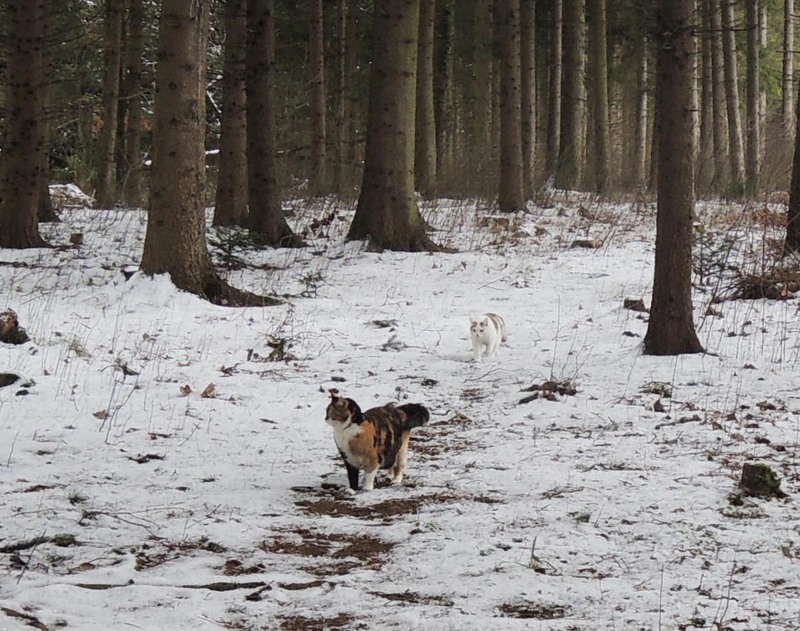 Three of my feline friends still accompany me, braving the cold, on the daily walk through the forest. Linda is the most eager participant. She is now half a year old, bursting of energy, always on the move, jumping around, crawling into the underbrush, and sniffing everywhere. The other two courageous walkers are Princess Min Ki and Rosy, with 11 and 12 years already senior cat ladies. They feel a bit intimidated by the young vital cat but Linda is making everything right, always being respectful and friendly to her fellow cats. This walks go on now since 12 years, and Rosy is the only one of the original cast who is still around. 12 years is a long time, and it were amazing 12 years, worth to write a book about it (or at least collect all the blog posts which I published about the walks in one folder). The roads are often icy and slippery, greatly increasing the risk of an accident. Fortunately the need to go out shopping is greatly reduced in my household. The freezers are still two-thirds full with late years harvest from the garden and the stocks of staples like lentils, rolled oats, and rice will last for at least half a year. A few days ago I had to go shopping nevertheless because cat litter had run out. I went to a supermarket who is a known vendor for a special cat litter which can be composted. Unfortunately the cat litter was sold out, other cat hosts seem to encounter the same problems as I do. I went to two other supermarkets until fortunately I found the desired cat litter. I didn’t buy any other items but as I rushed through the aisles I looked at the pet food and discovered that at all venues the cat food section was at least twice as big as the dog food section. It seems that cats in my location and probably in many other places too increasingly outnumber all other pets, a development confirmed by official statistics which state that somewhere around 1996 cats overtook dogs as the favorite human pet companions. According to Euromonitor, a company which makes a business out of estimating pet populations around the world, cats outnumber dogs three-to-one in Switzerland and Austria. 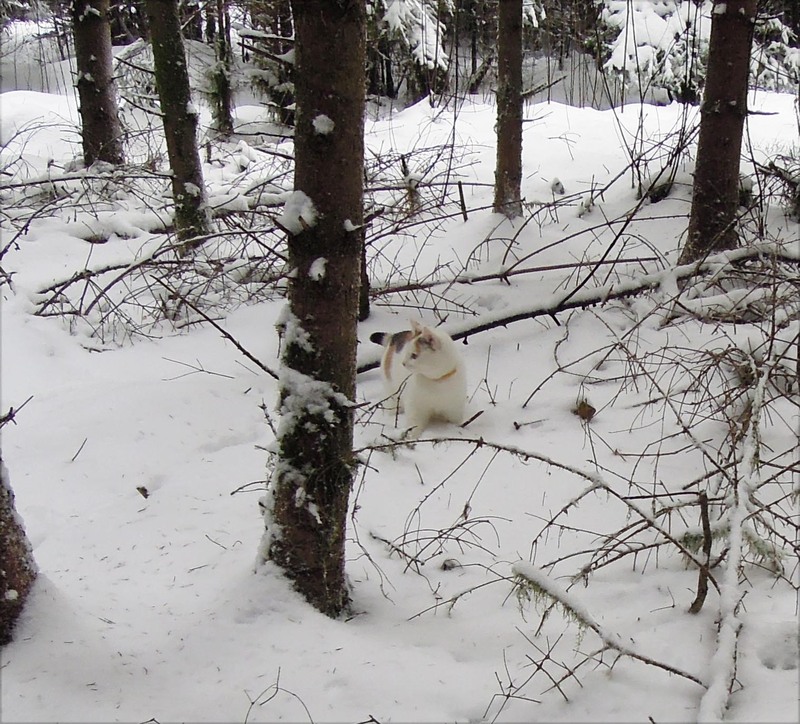 Cats dominate also in Sweden and they top dogs in most other European countries, in the Middle East, parts of Africa, North America, and Indonesia. An old statistic from 1998 (I didn’t find a more recent one) says that the countries with the heighest cat per human population ratios are the USA, Austria, Switzerland, Netherlands, Hungary, Slovenia, Sweden, Belgium, France, Norway. These are all quite affluent countries, but it is probably too advantageous to jump to the conclusion that the cats are responsible for the prosperity. The official cat numbers are most certainly too low because the feral cat population cannot be estimated by any means. Cats are elusive even in that respect. The popularity of cats is undoubtedly helped by the fact that they are simultaneously affectionate and self-reliant: They need no training, they clean and groom themselves, they can be left alone without pining for their owners, though most nonetheless greet us affectionately when we come back home again. If we are away for too long, they will be sulking and let us know that it was not right to disappear for such a long time. In contrast to almost every other domestic animal, cats retain remarkable control over their own lives. Most do whatever they please and go wherever they please and when they feel impeded or trapped they will take the first chance to escape and search for a better place. 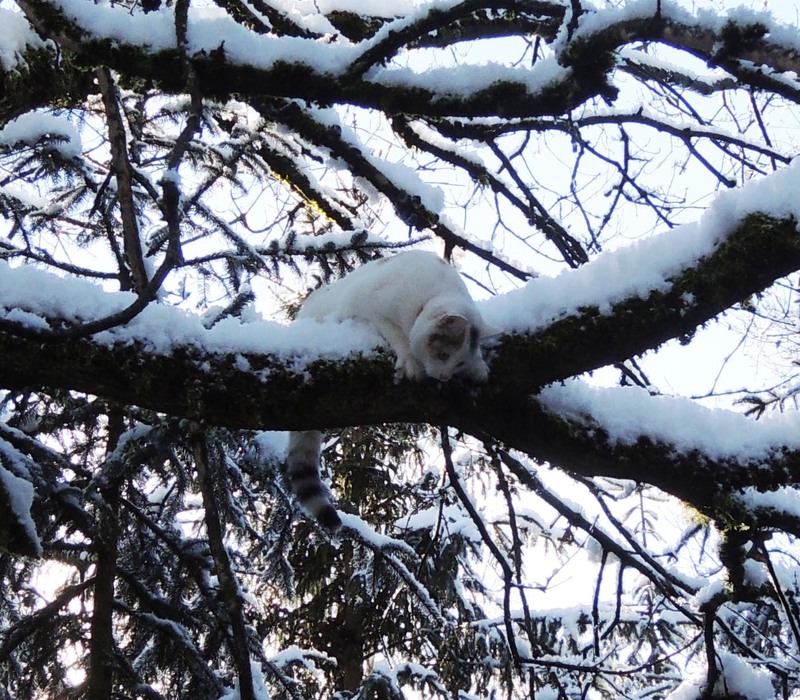 Many notices on lamp posts, fences, and walls about missing or lost kitties confirm this particular cat behavior. The missing cat most likely didn’t get lost but just moved on to greener pastures. Sometimes the lost cat returns after a few days or weeks, which means that a better host was not found and the animal came to the conclusion that the old place was still the best deal in store. Cats are not heroic, are not overly loyal, and will not (or only very seldom) sacrifice their life for the human friend, even if they like her or him very much. And that is how it should be. If one feels threatened, one has to get a dog, hire a bodyguard, or move to a safer place (the latter seems the most sensible option). Cats can be very affectionate, but they are loners by nature and seldom have more than one or two friends. This stems from their evolutionary past: Wildcats are largely solitary, territorial, and regard most other cats as rivals. 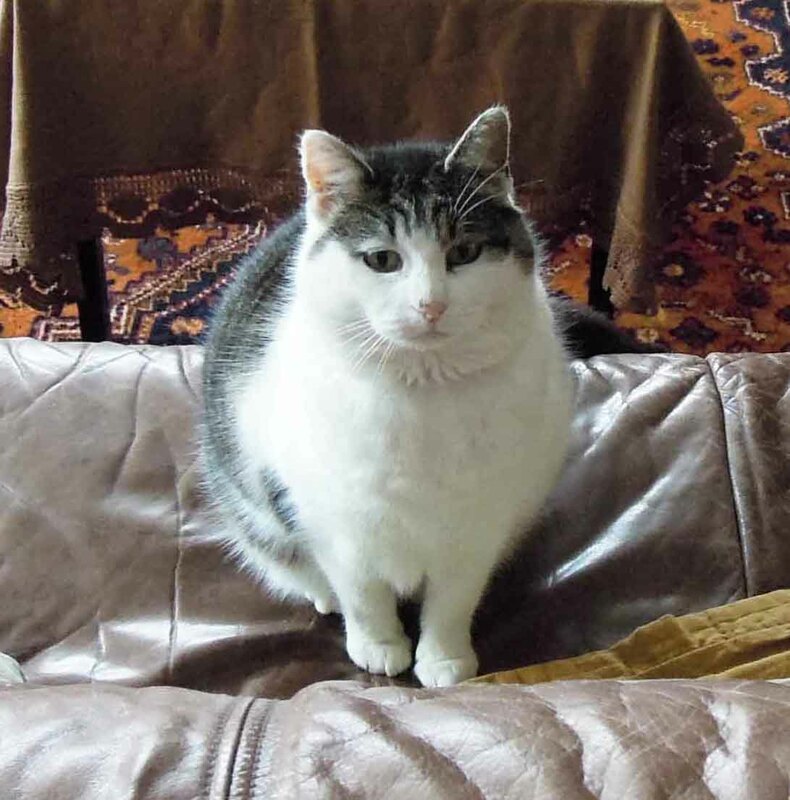 Domestic cats’ default position on other cats remains one of suspicion, though there are huge individual differences. Just like humans, cats can learn, change, reinvent themselves. They can greatly extend their social repertoire and nearly always will return the love and affection they receive. And often they will give it back double. Miss Maple, our 17 year old cat lady, who five years ago fled from a neighbor to join the family, is a good example for cat-adaptability. She was quite troubled and difficult when she came here but is getting nicer and more agreeable all the time. She is still an old crabby lady, her arthritis makes her sometimes itchy and bad-tempered. But she starts purring when I talk with her or touch her and she doesn’t object anymore when a fellow cat lays down beside her. Well, life is a chance, and for some people it can be a sequence of missed chances. We are only seldom in the right place at the right time, and if such an event accidentally happens it may even be that we are not aware off it and are missing an opportunity that will never come again.